Svetlana Alexievich was an unusual choice for the Nobel Prize because her work is investigative journalism, whereas the prize is supposed to be in the field of literature the most outstanding work in an ideal direction. Her win is a further blurring of the definition of literature to mean almost any kind of writing, her citation simply saying that it’s for her polyphonic writings, a monument to suffering and courage in our time. Secondhand Time is uniformly grim reading. There are multiple threads to the book, but an early one intrigued me. – For me, it’s more of a concrete question: Where do I want to live, in a great country or a normal one? This made me think: what makes a people think they’re entitled to consider their country great? It’s actually quite a strange thing when you think about it, that we in our separate nations have a sense of entitlement about this, or not. Tossing thoughts around, I suppose that the US thinks it’s great because of its democracy and its military and economic might. Perhaps the UK thinks it’s great because of its history of empire, the Enlightenment and the peaceful development of universal suffrage. Germany and Japan wanted greatness in the 20th century, cast the globe into bloodshed and are now humbly just concentrating on being respectable. Middle ranking countries like Australia take pride in stuff like *sigh* sport; lots of countries that are, well, insignificant, probably only resent the greatness of others, if they think about it at all. And the Chinese? What are they thinking about this now? And India? Do they have ambitions to be great… and would they define it? When you read Secondhand Time you can see that the people of the USSR took great pride in the social experiment of socialism and having a social equality different to anywhere else. They also won the space race and they were a great economic and military power. They had a vast empire, and (maybe they were deluded) they felt a sense of unity and security about the network of Soviet states. They were a rival to the greatness of the USA. They did not have expensive consumer goods and they had to work incredibly hard, but you get the impression from the testimony in this book that they despised people who thought that luxury goods were important, and that they felt they were working hard to accomplish something significant. And then it fell apart, and while the rest of the world cheered them on, the Soviet people felt like catastrophe was at hand. (p.73) It seems like a similar blow to national pride to the way the British felt when their Empire collapsed after WW2, but the impact on ordinary people was entirely different because all the infrastructure of Russian social security collapsed as well. But it wasn’t just that oligarchs got rich and poor people starved. It was that beliefs held for decades, and aesthetics such as valuing reading, were invalidated overnight. All kinds of issues fester. Families were split when the various republics hived off; free travel throughout the USSR has been replaced by the need for a visa, and in the new republics people don’t speak the lingua franca – Russian – any more. Russians have found themselves to be foreigners overnight, and in some places they are targeted for violent reprisals. Treasured memorabilia of the soviet era are labelled relics of totalitarianism and sold as trinkets on the street. Nobody’s interested in memories of Soviet achievement, and they don’t want to hear about repression under Stalin either. An entire value system – imposed from above but internalised by many all the same – has vanished and been replaced with individualism and consumerism. The sense I get from Secondhand Time is that the change in individual consciousness is as overwhelming as it was after the Revolution. I remember reading Doctor Zhivago (see my review) and getting some idea of it when a middle class family suddenly had to share their house with complete strangers. It’s an interesting question: what would the result have been if there had been a vote? Under socialism, I was promised that there was a place in the sun for everyone. Now they’re singing a different tune. If we live according to Darwin’s laws, we will enjoy abundance. Abundance for the fittest. But I’m one of the weak. I’m not a fighter…. There was a plan for me and I was used to living according to plan: school, college, family. My husband and I will save up for an apartment in a cooperative, and after the apartment, we’ll save up for a car… Then they cancelled that plan. Threw us to the wolves of capitalism… I have a degree in engineering, I worked at the design institute that everyone called the “women’s institute” because it was all women… […]… but then they started downsizing… They didn’t touch the men, there weren’t that many of them, or single mothers, or women who only had one or two years left before retirement. They posted lists, and I saw my last name on one of them… (p294). She’s now given up hope of getting a job. She talks about a colleague who’s now a servant, walking a businesswoman’s dog. Today, it’s embarrassing to be Russian. And so it goes on. The multiplicity of voices is fascinating, and much of it makes very sobering reading, but I found it frustrating that there was none of the journalistic analysis that I’m used to. Its main value, it seems to me, is in raising awareness that for many people socialism remains an ideal, if it’s implemented without Stalinism and repression. But since there’s nothing to indicate how widespread these attitudes are – not even a very clear indication of generational differences – the book floats in a bit of a vacuum. That makes it interesting, but I’m not entirely convinced that it’s Nobel-worthy. I had been waitlisted at the library for this book for a few weeks before I cancelled it, I think because of a comment you made on good reads that it is hard going. I don’t have the headspace for this type of book right now but now I have read your review I’m not sure I’ll bother at all – I like reading about things I know very little about but I do think you need context and it doesn’t sound like this has much context. I know what you mean … I’m glad I read it, but there is so much bad news around the world at the moment, and everything seems so uncertain, from Brexit to Trump to that character in the Philippines with his extra-judicial shootings…and here in Australia we’ve got Hanson in the Senate and gosh, we can’t even get a census right any more, and that’s something we’ve done successfully in this country for over a hundred years. I just want to put my head in the sand for a bit. So right now I’m reading light fiction and shorter works of more literary fiction and that suits my mood quite well. Surprisingly, I’m also enjoying John Brumby’s book. There’s something rather comforting about reading about how to achieve sound, steady, stable government instead of the chaos we’ve got now. Also, who could have imagined the whole socialist country, the winner of WWII and the space race, the challenger to America, would simply be sold off to the highest bidders? Hi Becky, I think you’re right, and I am going to check out Chernobyl as well (after a bit of a break LOL). An unusual choice but an interesting one! Great review – I really must track this down. Oh, good, I’m glad I haven’t put you off! Nobel Prizes seem often to be a bit dodgy, think Kissinger or even Obama (right at the start of his term). However if as Becky says Alexievich has a substantial body of work then that makes a difference. The big problem with Russia is a) it seems the oligarchs stole the whole economy; and b) western triumphalism over the ‘fall of communism’ makes it hard to see what is really going on. Yes, exactly,. and I wonder whether the prize in part was a way of giving prominence to a PoV that tests western triumphalism. WE know that thousands died because of collectivisation, but I wonder how many have died of hunger and cold in the streets since the Fall. (The Russians call the dead who are found when the snow melts, Snowdrops). I’m buying Secondhand Time this weekend because of Mireille Juchau’s terrific review in the papers today; also will get the Chernobyl one as well cause it’s been on my list. Will come back and read your review and comments shortly! Have a great weekend. 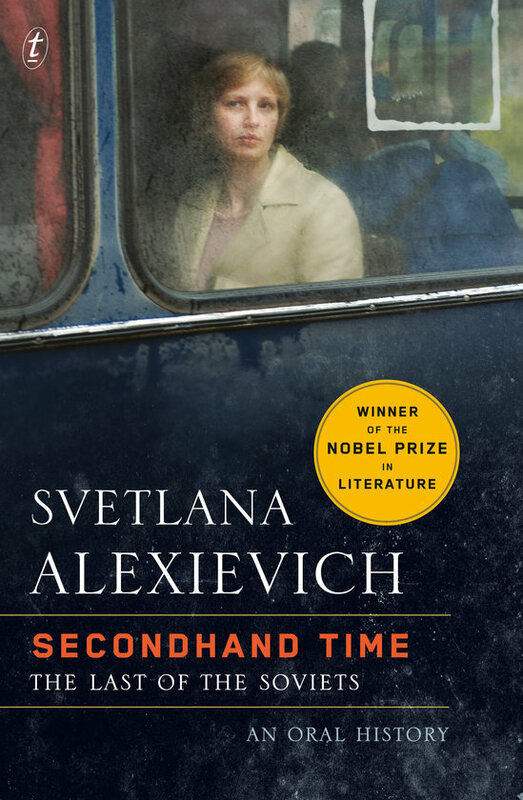 Here is the link http://www.theaustralian.com.au/arts/review/secondhand-time-svetlana-alexievich-bares-russias-soul/news-story/b175bf6a20d225d5f4ffb5d76e1c692c but maybe you’ve found it already, in the Australian. Great review, thanks! I read both Chernobyl and Second Hand Time this past year. Wonderful books in many, many ways. That is great to hear, am really looking forward to them.